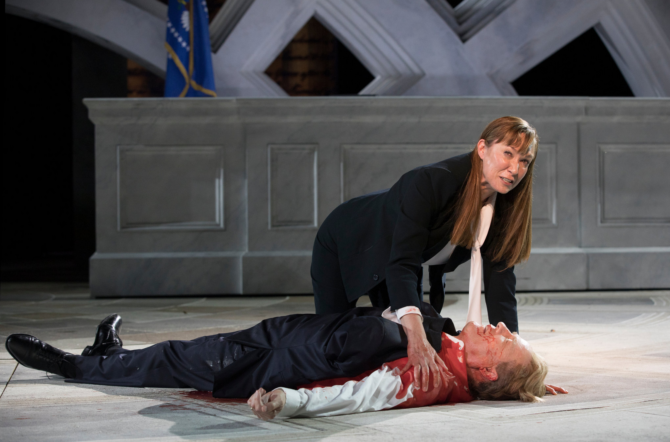 A small, rural theater company has recently found itself the target of some pretty vicious email attacks from people who are pissed off about a production of “Julius Caesar” featuring a Donald Trump lookalike who gets assassinated, South Coast Today reports. For the past week, Shakespeare & Co in Lenox, MA has been inundated with threatening emails from Trump supporters over the production. “They’re hostile, they’re abusive, and they wished us ill will,” artistic director at Shakespeare & Co, Allyn Burrows, says. There’s just one teensy, tiny problem. The Public Theater of New York came under fire for the production earlier this month, resulting in Delta Air Lines and Bank of America pulling their sponsorship of the play, which closed last weekend. So far, Burrows says, no one has apologized for the mixup. This case of stupidlu mistaken identity is exactly what I would expect from people who still support Trump. Sorry ’bout it. Until now, most of them didn’t realize Britney Spears’ brother was a Playwright! If some idiot theater group did a play about assassinating a President Obama look-a-like we’d all be saying what sick and twisted racists they were. So what’s different about this “performance”? Nothing.